This does NOT mean you will be going or are placed in a lineup, just that you are available to attend should the coaches have you in a boat. Most 1st year rowers will not be attending this race but still let us know if you want to/can. October 16, 2017 - 1st info posted. If this is your first regatta, please keep in mind that we provide all the info we can but sometimes it's a moving target due to changes in schedule of the regatta. Our report and release times take into account equipment prep & warm up time. We ask that all rowers arrive on time and plan to stay until released unless you have pre-arranged permission from your coach to be late or leave early. The event is held at the Tampa By-Pass Canal at Harney Park. want to GPS something close to the course. Robert's notes: This is a great course, with very good viewing but having been a few times, I tend to have to hunt around for it. Some GPS gets you right there, others takes you a bit off course. You're usually best to follow GPS until you get to the area, then follow the directions provided. 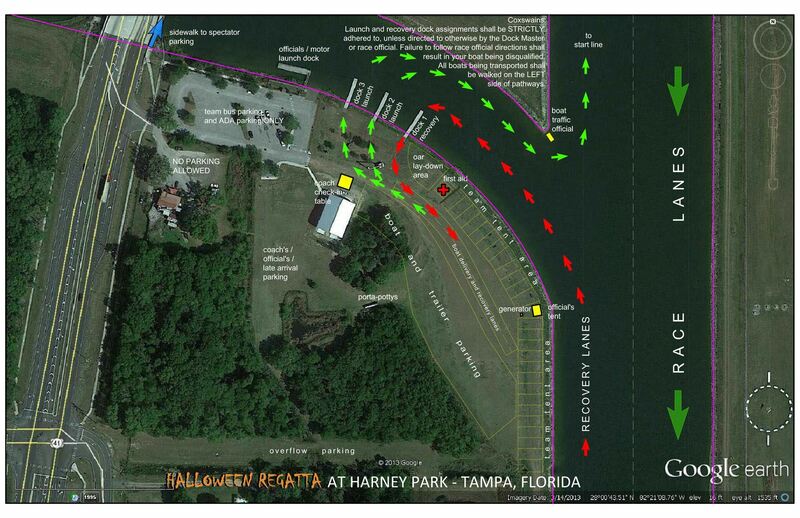 This regatta requires you to have both waivers to race. 8:30am next to the USF boathouse (the only one there). We will NOT have our SORA boat trailer at this regatta. Light breakfast and snacks will be provided for the rowers.